There are so many components to blogging, especially fashion blogging specifically. Most people do not realize this–– they think it’s just snapping photos with your best friends and throwing a filter on them and uploading them to Instagram. This is sometimes, if rarely, true–– but for the most part, us fashion bloggers have a multitude of problems to worry about. 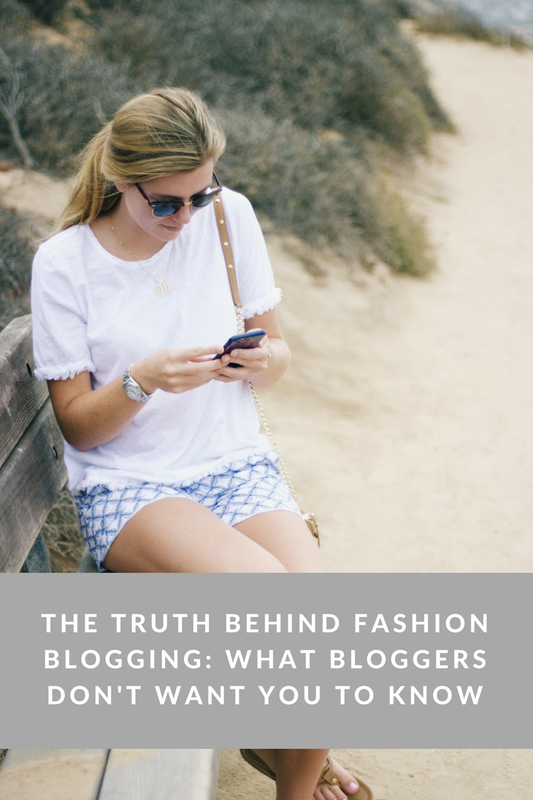 We rarely talk about them because we are afraid it will detract from what our blogs are supposed to be about, but I asked my Instagram followers if they wanted to know the “ugly” truth behind fashion blogging, and I got an overwhelming response. Over 200 people messaged me with their deepest burning questions, and a lot of them had overlap, meaning that a ton of readers were dying to know the answers to the same controversial questions. I had no idea my readers really wanted to know what was going on behind the scenes, and I am so ready to share with you guys what myself and other bloggers alike have to deal with. Yes, blogging can be rewarding, but it can also pose a myriad of hidden challenges that can be hard to surmount at times! “That’s easy, all you have to do is take photos and hit the upload button!” Wrong, it’s so much more complicated than that. First, you have to plan outfits and locations to shoot. I usually plan my outfits the night beforehand, and then I end up changing 36 times right before I leave to go to whatever location I’ve singled out for the shoot. The time of day also must be accounted for, since the sun is too harsh in the middle of the day to take quality photos. I try to shoot during golden hour, which is an extremely narrow window–– usually the hour after the sun rises and the hour before the sun sets. The hardest part for me personally is finding someone who knows how to use my camera that is willing to take my photos for me–– this is 95% of the time my mother, who does it without any complaints. I owe her the absolute world for this, because she does not have an easy job. I usually use her as the test subject and do a few test shots to get all of the settings on the camera right for her, but after that, it’s all in her hands. We both get frustrated, we yell at each other a lot because there’s disconnect in what we want each other to do, but we somehow always get it done. Sometimes, I dislike all of the photos we take and struggle to scrape up 6 or 7 from the shoot that are usable for a post. In a typical 15-20 minute shooting session, we sometimes take upwards of 300 photos. Putting the post together post-shoot is a completely different animal–– importing and editing photos takes on average at least 30 minutes, and actually writing the post and writing the HTML code for certain elements takes at least another 30 minutes. In total, a post takes a minimum of an hour to complete. This is one of the more controversial topics when it comes to blogging. Yes, fashion bloggers get paid for their work, whether it be through affiliate links like these or through sponsored posts. I get paid through both, but I make more off of affiliate links. I use Shopstyle, which pays per click, but some people find immense success through RewardStyle/liketoknow.it. The biggest downside to Shopstyle is that as more people click on your links, the amount you make plummets. I used to make around $0.08 per click, but now it seems to be about a penny, meaning that the first month I used it, I made around $1,000. Now, I make around $200 a month if I go all out really trying to use affiliate links everywhere. I never use affiliate links with the sole goal of making a profit–– the main reason I use them is because Shopstyle acts as a comprehensive search engine to find clothing items on, and it simplifies the selection process for me when I am recommending pieces to readers. Sponsored posts come to fruition in two ways–– either a company reaches out to me, or I reach out to a company that I am really passionate about and interested in. When a company reaches out to me, I heavily research it before deciding if I want to collaborate with them. If the products are not something I would genuinely use or wear, I politely decline immediately. For example, about three “preppy” t-shirt brands contact me a month, and although the word “prep” is in my blog name, I have completely outgrown this aspect of my life. I politely decline them all–– it just isn’t me! If something catches my eye, then I do more research, looking at how the company got their start, what their mission is, etc. A ton of bloggers (literally way more than you’d think) take collaborations just for the free stuff, no matter how “off brand” the products are for them, and sometimes they will collaborate without asking for compensation for all of their hard work! I recommend only collaborating with companies that know your worth and pay you for your work–– why in the world should anyone have to work for free? If I don’t like a product sent to me by a company or if I think the quality of it is off, I either tell my readers why I don’t like the product or I contact the company and offer to send the products back. Even if companies are paying me, I don’t think it’s worth lying to readers just to gain a product. That could jeopardize the trust between me and my readers, and I would never want to do that! A lot of people wanted to know how much “free stuff” I get–– this heavily depends month to month. Over the summer, the amount of companies I collaborate with and the things they send me increases because I actually have time to dedicate to my blog, but during the school year, it’s significantly less. Last month, I collaborated with Lilla P, Godiva, and Popsugar. It was a slower month. I’m not going to lie, mail days and new collaborations are my favorite. I am still in shock every time a company wants to collaborate with me and it’s a good fit–– I feel like a kid on Christmas! Another thing that goes widely unknown is that many bloggers have to pay taxes on their earnings. A majority of affiliate programs make you fill out a W-2 before you can start making affiliate links to share with your readers. I’ve filled out so many W-2s over the past three years that I have basically memorized how they look. Blogging is considered a real job by the IRS when you hit a certain number of earnings, which means that things get complicated and adult-like real quick! Besides turning down collaborations that don’t go with my style, I also try to only put together outfits that I would genuinely wear. I do not adhere strictly to trends that I know would attract more viewers–– I find this to be deceitful! Every once in awhile I will do trend posts encapsulating a bunch of trendy items that would sell to readers, but you bet that I only include them if I own them myself or if they are on my wishlist! I think that is is so important to stay true to yourself when blogging. I struggled with this in the past, especially when my style began to shift away from preppy. I felt like I had to keep wearing preppy clothing to satisfy my readers, but quickly found out that no matter what I wear, I will always have people that look up to me for my style. Some bloggers pile on as many high end fashion labels as possible; I do not. I try to mix higher end things with affordable pieces that I know and love. This makes blogging an affordable hobby for myself and it makes my outfits more affordable for readers. I’ve worked with brands ranging from Neiman Marcus to American Eagle. There’s this one blogger that I know (I won’t say a name obviously) that buys high end clothes and accessories to shoot in, keeps the tags attached, and then returns them right after because she cannot afford them! Not only is she presenting a different version of herself than what is true to her readers, but to me, this seems like such a hassle! I also personally cannot imagine making a weekly trip to Club Monaco just to buy blog clothing only to return it days later. I would want to keep everything so badly! To have a successful blog, you don’t have to dress in head to toe Chanel–– hell, you can wear exclusively H&M, Target, and Forever 21 as long as you know how to style it in an aesthetically pleasing manner that resonates with your readers. It’s about the compilation of the outfit and the personality, not the individual components. For some reason, readers think that I am put together on a daily basis. As I type this, I’m sitting in class wearing running shorts, unbrushed hair that’s 50% dreadlocked, an XL tee, and a golf pullover with a little bit of green tea spilled on it. Sometimes I wake up in the morning and I just really, really don’t want to get dressed nicely. You guys see how I dress about 60% of the time, but the other 40% is a s**tshow. 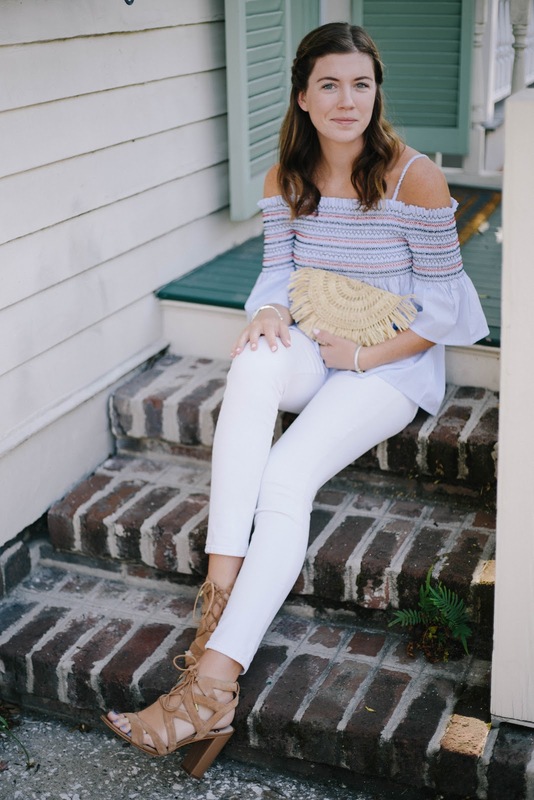 Other bloggers are almost always put together–– Julia of Gal Meets Glam is a perfect example of this. I envy her because even on days when she’s not shooting, she wears the most adorable outfits (and she started a daily outfit tab on her blog so readers can see them all; obsessed). Even when she snapchats herself post-workout, she looks like a sweat free athlesiure queen. She’s my girl crush and I admire the hell out of her for always having her s**t together, but I’m just not in a stage of life where this is possible for me. This pressure is unrealized by many, and the magnitude of it is insane. Think about the pressure that you feel when you post an instagram as a non-blogger–– What filter will you use? Does it go with your theme? Will it get more likes than average, or will it underperform? Not everyone worries about these things (I don’t on my personal instagram, which y’all know if you follow it), but these worries are magnified when your follower amount increases. More people are seeing your pictures, which means the expectations are also increased. Whenever I talk to other bloggers, this is the aspect that they hate about blogging most that they emphasize. This pressure literally causes post anxiety for people. This may sound lame or stupid to some of you guys, but imagine how weird it is for 10,000+ followers seeing a photo of you. If you don’t have a ton of self confidence, this is literally a nightmare. I’ve seen so many ridiculously bad FaceTune edits of bloggers that are trying to make themselves prettier for social media, and most of them are beautiful in the first place and do not need it! I’ve had so many bloggers text me freaking out about an Instagram they were thinking about posting, wondering if it would get likes or go with their theme. I always tell these people that the only thing that matters is that the photo makes them happy. If you’re genuinely happy in the moment, who cares what other people think? The pressure to make blog posts popular/viral exists too. I once worked with another fashion blogger that got married and his wedding was covered by a ton of magazine websites (again, not naming names). When I texted him to congratulate him, I kid you not, his response was something along the lines of “Thanks so much! Website views are through the roof since the wedding went viral! I should get married more often–– I can’t believe the press!” This shocked the absolute hell out of me. His ceremony was 100% for publicity, and all of these websites were portraying it as some heartwarming and lovely ceremony. Maybe it was heartwarming despite all of the cameras everywhere; I wasn’t there, but It wasn’t even his real wedding, and he had advertised that it was. He had gotten officially married the week before at the county courthouse. There’s also pressure to stay positive–– if there’s even a tinge of something that could suggest you’re unhappy in a post, it makes you seem weak (to some at least). Although I don’t buy into this and I allow myself to show a range of motion, a ton of bloggers put up a front that their lives are perfect and everything is totally easy breezy. It’s important to remember that everyone is going through something, whether they show it or not. Everyone is human! Balancing blogging and school is impossible at times, and when it is, I usually shove my blog on the backburner. Right now, I’m taking 20 credit hours and I’m in my senior year, which means outfit posts especially are nonexistent. A ton of people keep asking me when I’m going to post next, and the answer is that I never really know. School is the most important thing to me, and blogging is just a side project at this stage in my life, meaning that I value putting more work in getting an education than I do showing people what I’m currently wearing. Whenever I am at home on break, I always put seeing family first over blogging–– family is the #1 thing to me over everything else! It’s also hard to balance all of this while maintaining a social life (although I currently don’t even have time for a social life right now). My end answer is that for me, blogging is very fun and allows me to be creative, but it’s not as important as family, school, or friends. I’ve been using Instagram as a vehicle to share my outfits and my life with readers because posting on Instagram takes 10 seconds as opposed to the hour it takes to publish a blog post. If you want to get into blogging and don’t have the time, I would heavily suggest putting a ton of effort into establishing an Instagram account instead. It’s much easier to balance an Instagram account and school/a job than balancing an actual website and school/a job! I’m not saying that blogging can’t be important–– in many stages of my life, it has been the most important thing. When I work on big projects with brands I love, I prioritize it because it helps me build relationships and make contacts that I can use later. If it’s summertime, I treat it like my job since I’m not focusing on school and it’s something I really enjoy. Sometimes I get burnt out and back off, and that’s okay too! It will be interesting to see how the dynamic of this changes as I graduate from Rollins, but as of now, how I allocate my time and energy is all over the place in a typical year. In my opinion, the biggest misconception about blogging is that it’s easy and not a ton of work is involved. Many people really do think that it’s a breezy process and they will look at you dumbfounded when you say it’s actually “hard.” It can be easy at times, but it can also be extremely difficult. It’s hard to put effort in on some days when you’re only seeing minimal results. It’s brutal when companies contact you and you have to turn them down because they expect you to work for free or their values misalign with yours (and by god most of them do expect you to work for free because they don’t value your time and hard work. Know your worth!). It’s especially hard when you’re first starting out and you don’t see success immediately–– it’s SO important to remember that success is a marathon, not a sprint! Success is super fun, don’t get me wrong, but your end goal should be to blog to make yourself happy, not others. There are so many factors that could be attributed to the overall difficulty of blogging, but it’s all rewarding in the end because of the people you meet along the way and the things that you learn. I’ve made so many amazing friends since starting my blog, and that’s probably my most favorite part of blogging. Blogging has changed my life in a multitude of ways, and I never regret starting one, but I always wish that people knew the actual factors associated with running a blog. Hopefully this post helps inform my readers of what’s actually going on behind the scenes and what I experience and feel when sharing my life with others. I am always thankful for every single reader I have, and I appreciate the constant love and support I get from all of you! Thank you so much for posting this today. Your feedback on the blogging world is great to hear. Not everyone understands how much time and effort can go into something as "simple" as taking photos or posting an Instagram that matches your theme! It sounds trivial but when you make a blog your business,things like that matter. Thanks again for your insight! Thanks for reading it! I appreciate your kind words. I love your advice. I got serious about my blog in January. I always love seeing readers comments. They always make my day. Very interesting insight on blogging...I had no idea how it works. You're right that being happy is the best measure of success. I'm proud of you! I am OBSESSED with this post. This is by far my favorite post! I can definitely relate to so many things you touched on. Blogging can be so much more complicated than it looks from the outside. Thank you so much for sharing your honesty, advice, and insight! Thanks so much Mackenzie! I really appreciate your kind words, and I'm glad someone else can relate to them! I love this post! I completely agree with you on so much of this... and especially that blogging is so much more than what it looks like. Thanks for your kind words, Frannie! This was so interesting and honestly eye opening! I just started a blog and have been so intrigued on how other fashion bloggers and the industry work!Thank you for your honesty, inspiring words and a wonderful post! Loved this post so much Isabella!! I love how truly real and authentic you are to your self within your blog, that is hard to find sometimes!! Love your posts, and every word of this is so relatable! I absolutely love how genuine this is. I hate when I am reading a blog post and it feels like it was created just for views etc. Thank you for sharing! This was such an interesting post! It shows how much you care about your readers! Thank you!